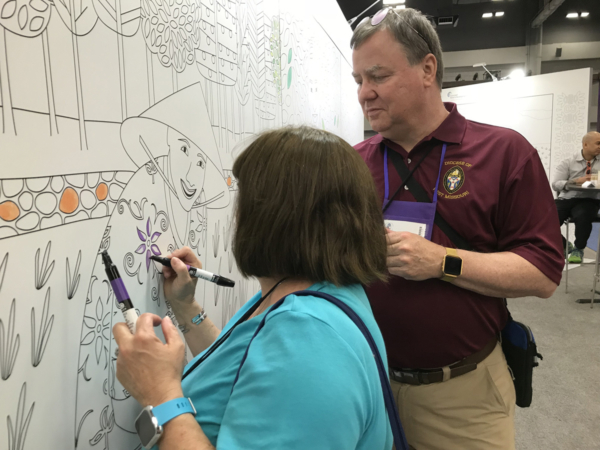 [Episcopal News Service] The action of General Convention can feel frenetic in a parliamentary sort of way and, when the Episcopal Church met in Austin earlier this month, Episcopal Relief & Development offered an antidote. 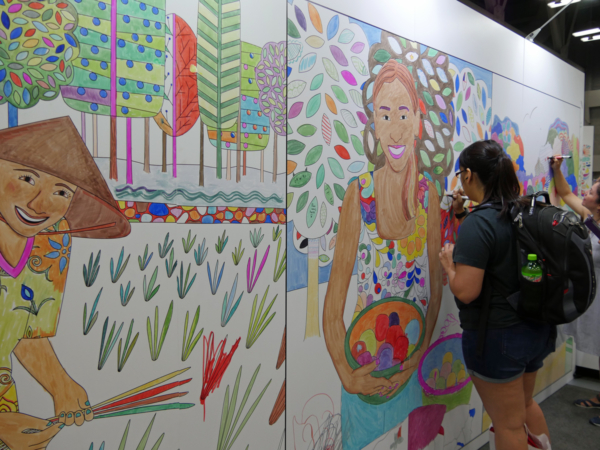 The organization’s booth, which was front and center in the Exhibit Hall, featured four life-sized coloring opportunities. Illustrator and designer Portia Monberg converted some of Episcopal Relief & Development’s most iconic images to help tell the story of the organization’s three key strategic priorities: women, children and climate. The two 8-by-8 panels and two 8-by-16 ones were blank canvases on July 3, ready for participants to color. By the time the Exhibit Hour folded its tents mid-afternoon on July 11 (two days before the end of convention), the panels were a riot of color. Some areas of the panels were colored precisely and complimented other more child-like spaces. And, the panels live on. The Rev. Anthony Guillen, the Episcopal Church’s missioner for Latino/Hispanic ministries, helped arrange to have Episcopal Relief & Development donate the coloring book panels to the Sunday schools at two Austin churches: St. James Church and San Francisco de Assis. For those who wanted to continue their coloring elsewhere, Episcopal Relief & Development handed out coloring books and colored pencils. The booth panel illustrations are included in the “Color Our World” book, which can be downloaded here. 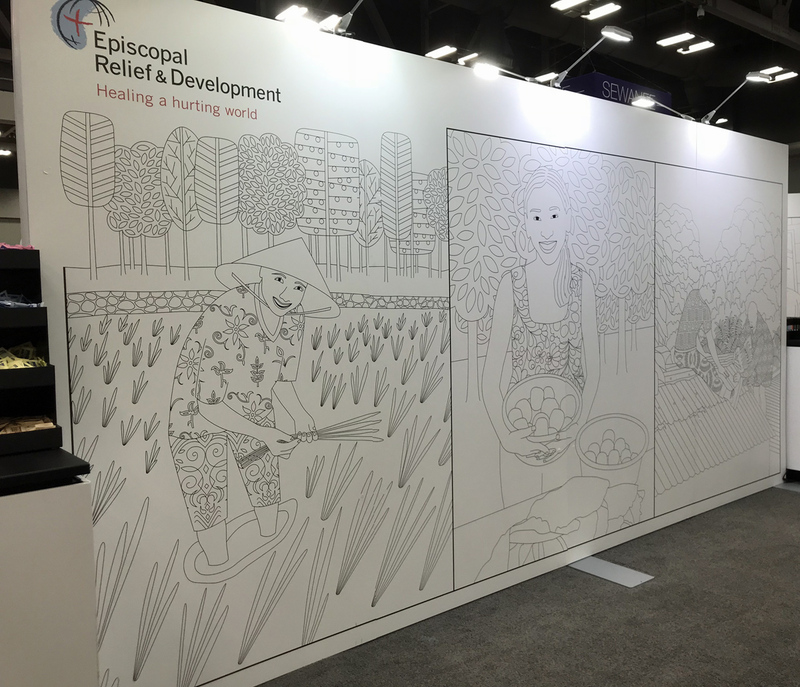 Episcopal Relief & Development also offered convention participants the opportunity to contribute to its climate-resilience programs to help offset the carbon footprint of the average attendee. Staff member were available to discuss the organization’s key program priorities and help people learn about the Episcopal Asset Map. Visitors to the organization’s loication in the Exhibit Hall could pick up giveaways and sample fairly-traded coffee and chocolate via Episcopal Relief & Development’s partnership with Equal Exchange. The organization offered post-TEConversations discussions related to its worldwide work. The three TEConversations were joint sessions of bishops and deputies that featured presentations on evangelism, racial reconciliation and care of creation. More information about Episcopal Relief & Development’s work on at the 79th General Convention is here.